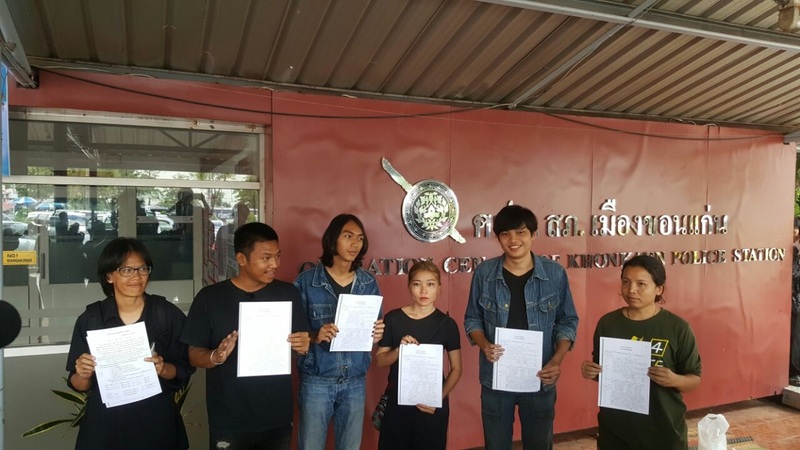 On 4 October 2016, 8 northeastern-based activists and human rights defenders reported to the Khon Kaen Provincial Police Station for the charge of violating the Order of the Head of the National Council for Peace and Order (NCPO) no. 3/2015, banning political gathering of five persons or more, due to a public discussion on the Draft Constitution held on 31 July 2016 in Khon Kaen. Two alleged offenders, Mr. Cherdchai and Ms. Panwadee Tantisirin, of the five recently accused earlier reported to the police to hear the charges on 30 September 2016. The reporting leaves out Mr. Rangsiman Rome, a key member of pro-democratic group New Democracy Movement (NDM), who refused to report himself nor be part of the legal proceedings inflicted by the NCPO orders. The police scheduled the 8 alleged offenders, who reported themselves on 4 October, to meet with a public prosecutor at the Khon Kaen Prosecutor’s Office on 16 November 2016 at 10 am. On 4 October 2016, six previous alleged offenders, which include Mr. Jatupat Bookpattaraksa or ‘Pai Dao Din,’ a prominent activist based in Northeastern Thailand, Mr. Narongrit Oopachan, Mr. Chatmongkol Jenchiewchan, Ms. Natthaporn Arjharn, local land rights activist, and Thai Lawyers for Human Rights documentation staffs Ms. Neeranuch Neamsub and Ms. Duangthip Karnrit, submitted their additional written statements to the Khon Kaen Provincial Police Station, for their charge of defying the Head of the NCPO Order no. 3/2015, prohibiting a political gathering of five individuals or more. Jatupat, a well-known young activist of the Dao Din Group based in the Northeast and member of the New Democracy Movement (NDM), was released on bail from 18 days in detention with 13 days of hunger strike in two different cases related to his exercise of peaceful assembly in August. On the same day, Mr. Panupong ‘Nice’ Srithananuwat and Mr. A (alias), another two alleged offenders who were later charged, also reported to the police, and denied all charges against them. Further, Mr. Rangsiman Rome, one of the alleged offenders and key member of the NDM, did not appear at the police station, and refused to report himself nor be involved in the legal proceeding, stating that any legislation issued by the NCPO lacks legitimacy. Rangsiman is also facing charges and military court’s proceedings in Bangkok under the Constitution Referendum Act B.E. 2559 (2016) Section 61 and the Head of the NCPO Order no. 3/2015 for distributing documents that deemed to prevent voters from casting a ballot or convey to vote. The additional statements read that the acts committed by Jatupat, Narongrit, Chatmongkol, and A are simply the exercise of freedom of expression and assembly invested by law, and are under the protection of the Constitution and International Covenant of Civil and Political Rights (ICCPR). In addition, Natthaporn, a local land rights activist, and Neeranuch and Duangthip, TLHR officers, were present at the event venue as observers and had no involvement with the organizing team. Although the three had clearly identified themselves with the authorities, they were accused of the same charge. Further, Mr. A was reportedly not at the event, but was accused as well. The 8 alleged offenders see that the acts do not fall into a breach of the Head of the NCPO Order no. 3/2016 Section 12. Since the purpose of said Order is to maintain public order and prevent disturbance, the alleged acts are not a gathering or assembly aimed to cause any political unrest or to violate the law. On the contrary, their acts are the exercise of freedom of expression under the Constitutional Referendum Act B.E.2559 (2016) Article 7, which states that individuals shall have the freedom to express and distribute opinions related to casting a ballot that is done in good faith and in accordance with the law, following the democratic principles. The case stems from the 31 July 2016 event titled the ‘Talk for Freedom: The Constitution and Isaan People’ forum at the Faculty of Agriculture, Khon Kaen University, organized by the student activists. Students, college lecturers, and Northeastern-based civil society networks together joined the event to discuss their opinions on the Draft Constitution and the then upcoming referendum. Similar gatherings were held at Thammasat University and elsewhere. As at the end of September 2016, there are 11 people who have been facing accusations and charges in this case which originated from a public discussion over the draft constitution in Khon Kaen. Other two alleged offenders, out of the five individuals who were recently summoned, Dr Cherdchai Tantisirin, a former Member of Parliament from Pheu Thai Party, and Asst Prof Panwadee Tantisirin, a lecturer at Nursing Faculty at Khon Kaen University, previously reported to the police to be informed of their charges against them on 30 September 2016. They denied all charges and testified that, on the day of the event, they had met with officers from the European Union and together listened to the speech of Mr. Piyabutr Saengkanokkul, a lecturer the Faculty of Law at Thammasat University. Further, they noted to the inquiry officer that; universities are for educational purposes; freedom of expression is guaranteed by the Constitution and international regulations; the Constitution Drafting Commission (CDC) stated the acceptance of different opinions; and the harassment against students and civilians during the presence of EU officers proposed a bad image of Thai authorities. In addition, the police scheduled the 8 alleged offenders, who reported themselves on 4 October, to meet with a public prosecutor at the Khon Kaen Prosecutor’s Office on 16 November 2016 at 10 am. The 11 individuals will face trial in a military court if indicted, since the alleged offences were committed prior to the enforcement of the Head of the NCPO Order no. 55/2016, which discontinues the practice of prosecuting civilians in military courts for crimes committed on 12 September 2016 onward. The Order does not apply to pending civilian cases or those committed before such date.Although the activity was carried out prior to the Constitutional Referendum, which won approval from Thai voters nearly two months ago, yet many activists and people have continued to face legal actions resulted from their peaceful exercise of freedom of expression and assembly. At present, 213 persons are facing prosecutions with various offences concerning the referendum, with the greatest proportion of defying the Head of the NCPO Order no. 3/2015, which prohibits political gatherings of five persons or more. Although the activity was carried out prior to the Constitutional Referendum, which won approval from Thai voters nearly two months ago, yet many activists and people have continued to face legal actions resulted from their peaceful exercise of freedom of expression and assembly. At present, 213 persons are facing prosecutions with various offences concerning the referendum, with the greatest proportion of defying the Head of the NCPO Order no. 3/2015, which prohibits political gatherings of five persons or more.